I tend to have an overall preference for diamond frames, and never considered myself a mixte sort of person. However, a couple of years ago Velo Orange was selling off a batch of their mixte frames at the attractive price of $300 so I mixed up the bike stable by adding a mixte to it. Over the next year Felkerino and I (okay, mostly Felkerino) built it up with a variety of parts from the Dining Room Bike Shop, including the front Rivendell Mark’s rack by Nitto, Nitto S83 seatpost, gearing, pedals, Tektro brakes, handlebars, and the bags. I also purchased a couple of things especially for the mixte, including matte Velo Orange fenders, VO saddle, and a Pletscher kickstand. I love that we were able to build up the Velo Orange mostly with things we already own. 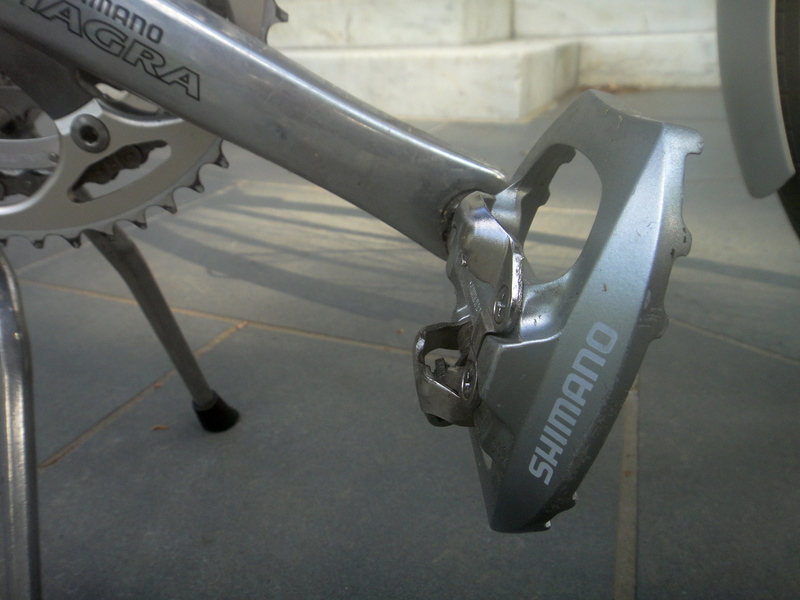 One of my favorite parts on the bike are these double-sided Shimano A530 pedals. Good for wearing with street shoes or SPDs. 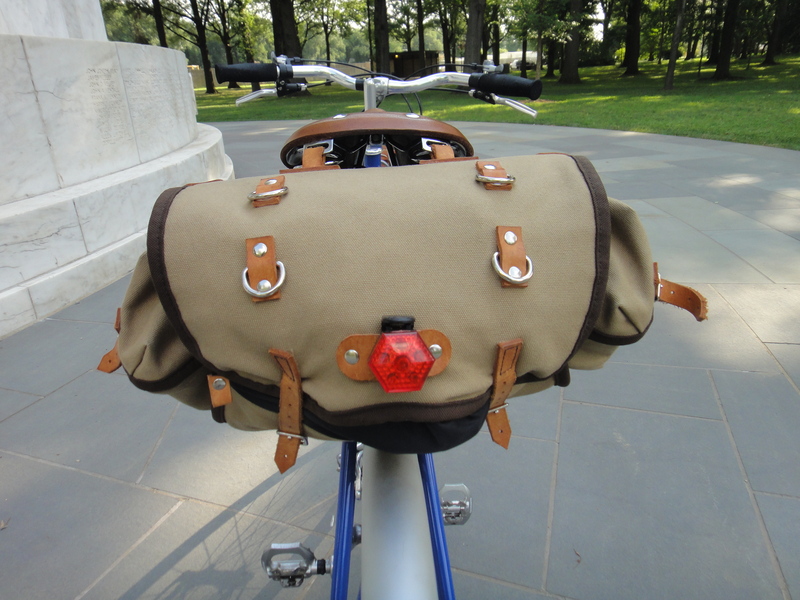 Also, it may go without saying, but I am especially proud of the bags on this bike. They’re just delicious. The front Berthoud bag was a gift from Felkerino. It’s big enough to carry my lunch and a few personal items, but not so large that it feels bulky or weighs the bike down in front. Nitto Front Rack for the Bertoud. Securely affixed. The tan Acorn bag, which I purchased on a whim, is made by a couple out of California. 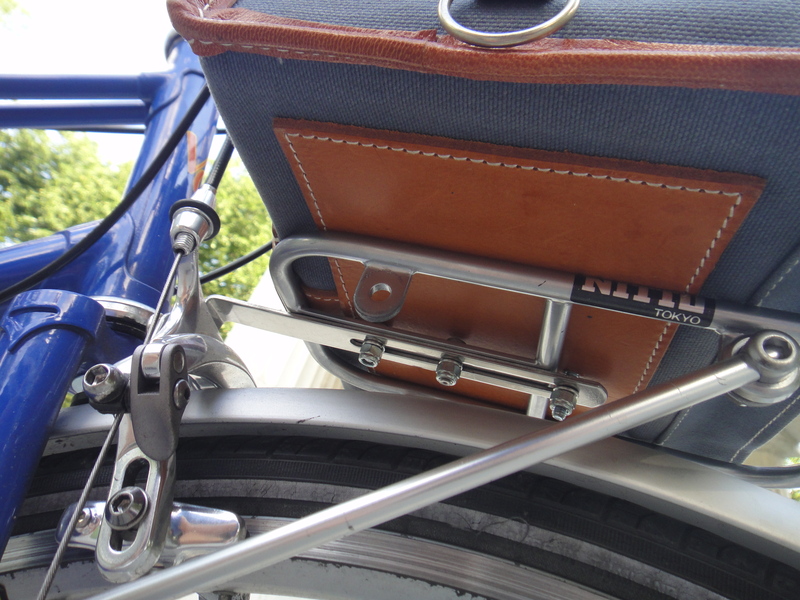 Sadly, they no longer make this rear saddlebag, which I find to be the perfect size for a bike like the Velo Orange. Not too big, not too small… just right. After the build was complete, the mixte spent a lot of time languishing in the Dining Room Bike Shop. For some reason, I convinced myself that I wasn’t stylish enough to ride it. I also wasn’t sure about its carrying capacity. I needn’t have worried on either front. First, I may not be stylish enough for it, but I don’t care. There’s no requirement that a person has to be stylish for a commute around town. A regular shirt and shorts work just fine. No fashion police arrests. 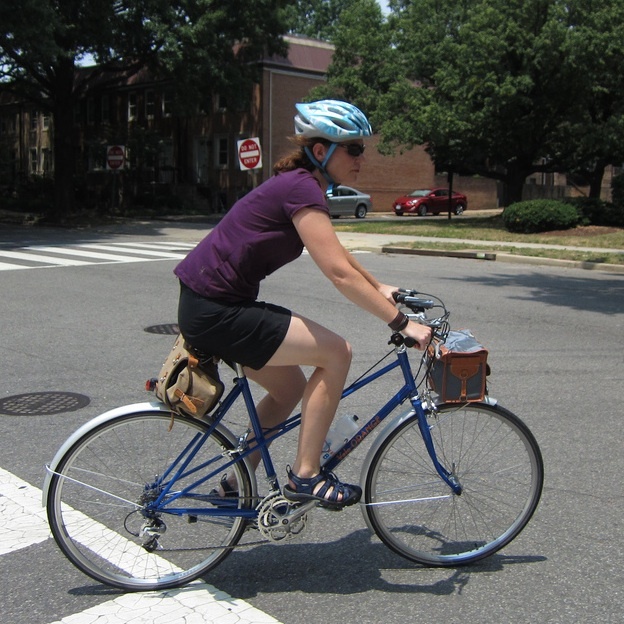 A shirt and shorts work just fine for commuting on the mixte. 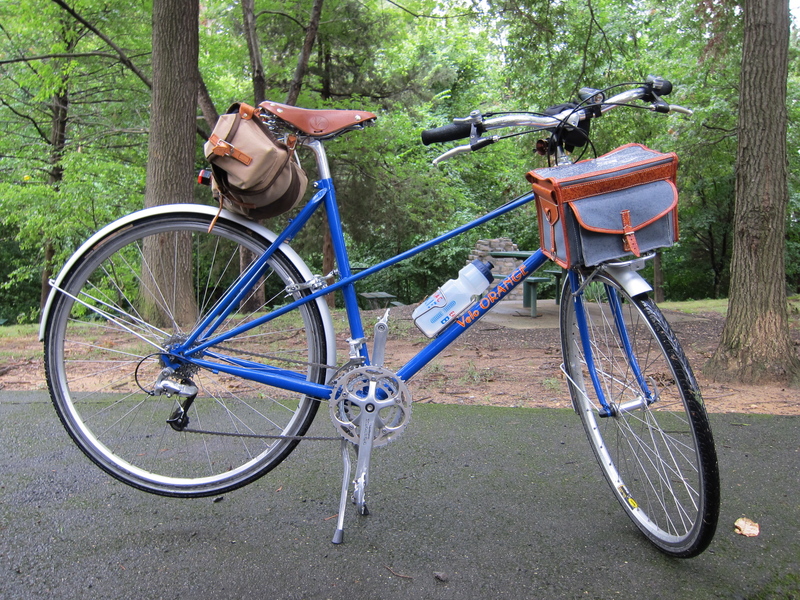 The Velo Orange mixte is a great getting-around town bike. It’s carrying capacity is somewhat reduced compared to my Surly LHT (which is set up for panniers in addition to a Carradice bag). I can pick up a little something at the store after work if I need to, but the Velo Orange is definitely not well-suited to a big post-work grocery run. 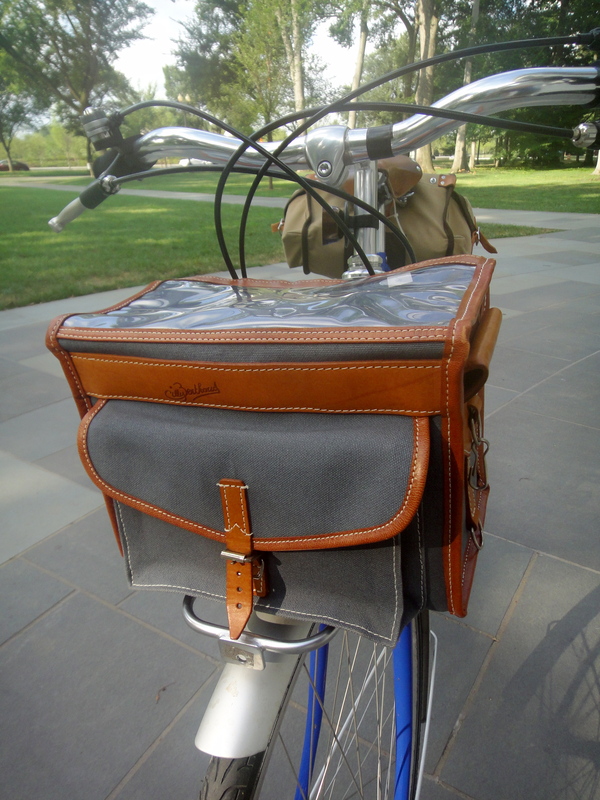 Nevertheless, there’s still ample storage in the Acorn saddlebag and the Berthoud. The bags easily stow my workout clothes, lunch, U-lock and tools, as well as any other daily essentials. The upright position and handling make it lots of fun to ride. The bike is quick to respond to any turn I make, and the wider hand positioning compared to drop bars is a refreshing change. With the exception of the more upright handling, the Velo Orange does not feel much different than my other bikes. For some reason, I thought sloping top tube would make it feel stodgy or noodly or something, but I have not found that. The bike accepts a small front load easily, and it still handles well. It even passes the no-handed test. See? No hands? No problem. 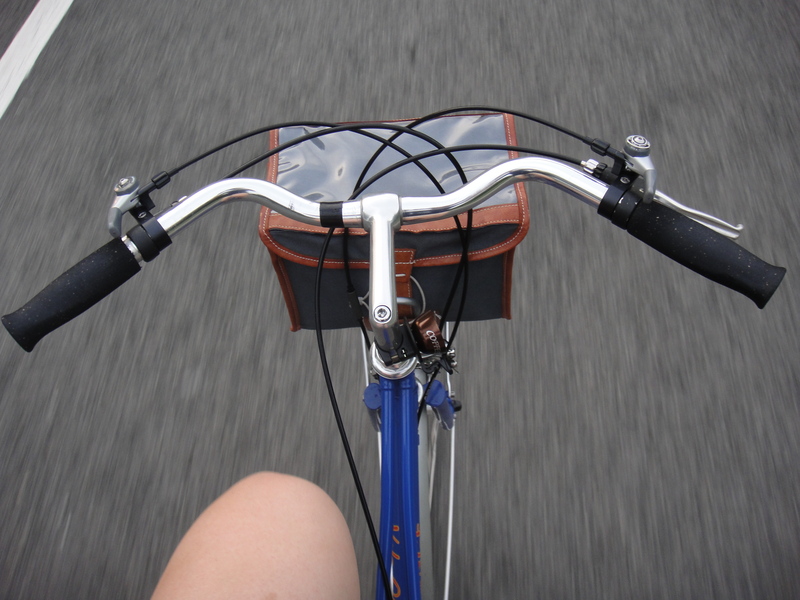 Going no-handed on the VO mixte. As I mentioned, I do sit more vertically on this bike than others in my stable, and it makes me feel like I’m just tooling around, seeing the sites, taking in the tourists. There’s no pressure AT ALL to ride fast. Just ride my pace and get there when I get there. Even so, the bike feels responsive and zippy. I push the pedals and they go. I turn the bars and we’re off and running. I don’t know if that’s because I am forced to not haul a bunch of stuff around or if that’s the natural feel of the bike. I tend to think it’s a little of both. With the Pletscher kickstand, I can park the bike anywhere. No leaning! That’s a great convenience, especially when I’m overcome by the need to take a bike glamour shot. Last week, I finally put the Surly LHT back into service after a full month of nonstop mixte commutes. I needed to haul more than the mixte was able to carry. It was nice to be back on the Surly and to have its extra carrying capacity, but this past month has been great for solidifying my appreciation of the Velo Orange mixte. The mixte is a perfect bike for days when I don’t plan to do any post-work grocery shopping or general hauling of stuff. On a day-to-day basis, I require less storage space than I’ve grown to think I need. The Velo Orange also reminded me of the “just ride” principle. Just get on your bike. Wear whatever clothes you want. Ride your bike. Commuting is not a fashion show (though I do like to get a little bike love now and then). It’s about getting around town on whatever you choose to ride and meeting your transportation needs under the power of your own two feet. Mary, You are more than stylish for such a bike. And when can I go shopping in the Dining Room Bike Shop? It sounds like the best shop in D.C. Backup tandems? and spare Nitto racks? Why thank you! Yes, the Dining Room Bike Shop is a pretty good shop, if you can deal with the management. That is a very nice commuter bicycle. I like the ability to carry some weight but not too much – I end up filling my two panniers whenever I commute. We just bought an old Miyata 215 touring mixte and put on rider bars and Sram twist shifters. It is a nice ride, now mostly used by my wife to carry one of our children but she would like to commute on it in the near future. I saw that Velo Orange sold the mixte but that seems to be no longer available. We also considered a Soma Buena Vista and Linus mixte before we found the Miyata, although the Soma could still be in our future. Thanks! Yes, I have the propensity to overload when I have extra carrying capacity. I just fill the space. The Miyata sounds like a good setup. 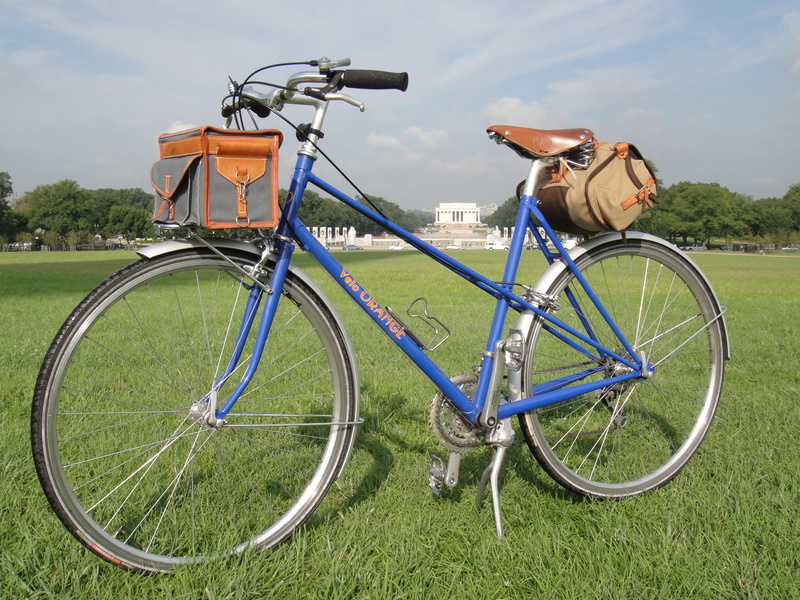 I like the look of the Soma Buena Vista, and would definitely look into it if I did not already have the Velo Orange. Hi Mary: What handlebars are those? Thanks. Hi Ryan, they are the Velo Orange Milan bars.